Ryan McGreevy started his undergraduate studies as a biochemistry major to learn more about the fundamental workings of life. Soon his hobby of tinkering with computers led him to take computer science classes, eventually adding it as a second major. During this time he worked several years in an analytical chemistry laboratory studying the environmental effects of methylmercury. Not sure if he was cut out for a life in a wet lab, Ryan was excited to learn from a bioinformatics course that computers were playing an increasingly important role in science. After graduating in 2009, he spent some time writing software for military flight simulators. He then came to the TCB group as a research programmer in 2010, to work on simulations of a different sort. Here he was able to utilize the knowledge of both his fields of study, applying computational methods to scientific inquiry. He currently works on the group's molecular dynamics flexible fitting (MDFF) method. MDFF takes high resolution X-ray crystallography structures of molecules and coaxes them into the lower resolution yet more natural conformations captured by Cryo-EM. Much of his work so far has involved implementing new restraints for use with MDFF. Molecules in an MDFF simulation experience deforming forces from the additional potential and require restraining forces to hold together certain structural elements. 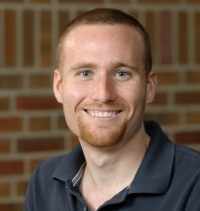 Ryan is also working on his master's degree in bioinformatics from the University of Illinois at Chicago. Click here to learn about other developers, scientists, and faculty working at TCBG. Contact Us // Material on this page is copyrighted; contact Webmaster for more information. // Document last modified on 04 Nov 2008 // 71879 accesses since 04 Nov 2008 .